Notice: I'm happy to announce my out-of-print book, "The Memorials of Acadia National Park," is now available as an Apple iBook. It has been revised and updated with color photos, new information, maps and GPS coordinates, and hyperlinking throughout. No part of this blog may be reproduced without the author's permission. 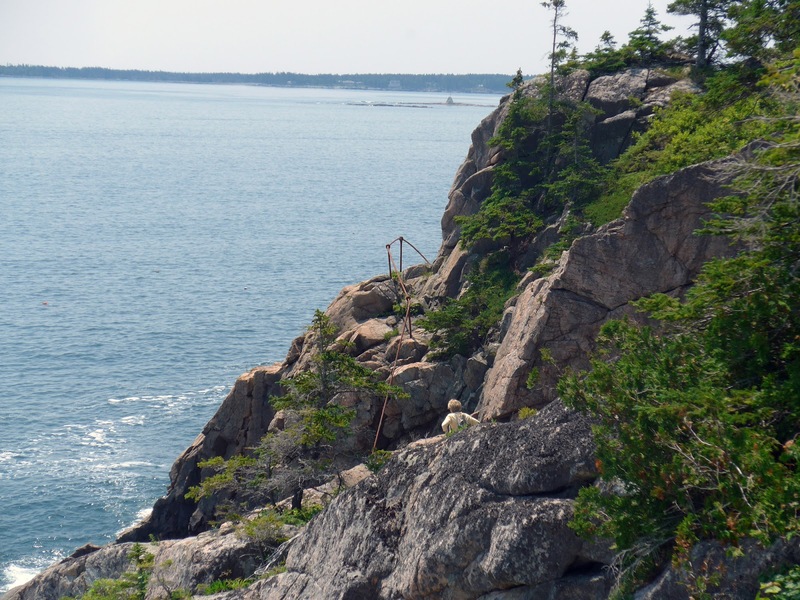 A century ago there were paths built to provide thrills for hikers of Mount Desert Island, ME. 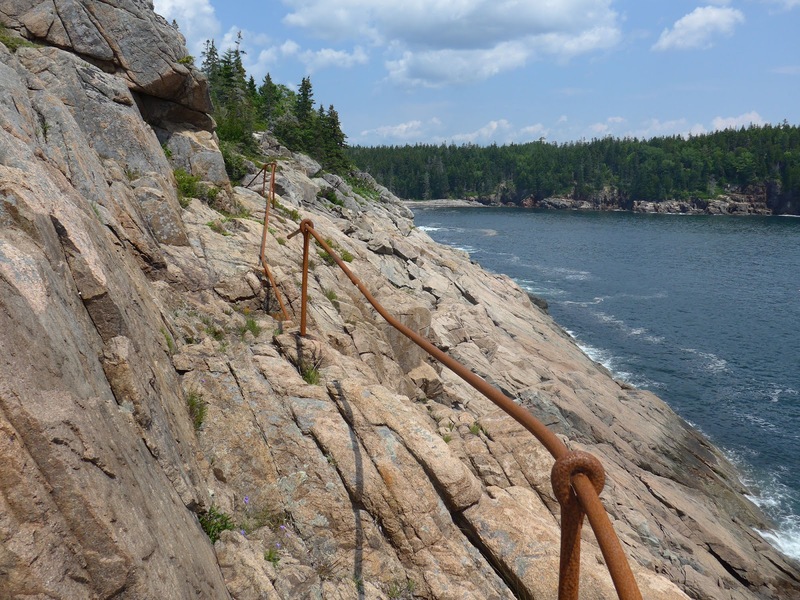 The Precipice Trail in Acadia National Park is notable and extant, but many others have been abandoned and left to decay. 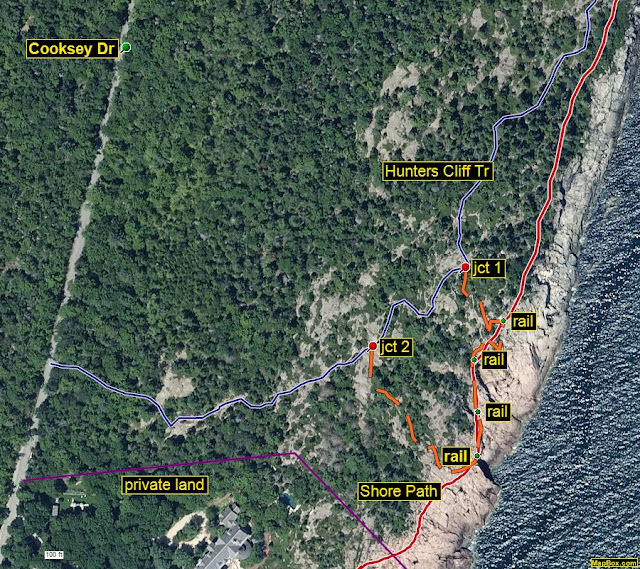 One of these, the Shore Path, was in Seal Harbor. The Shore Path first appeared on an 1896 path map, which showed it running between Sea Cliff Drive from just east of the Crows Nest to Hunters Beach, a distance of about a mile. *1 Sea Cliff Drive was built the previous year by Seal Harbor developer George Cooksey, an English immigrant to New York City and a successful grain broker. The road, later renamed Cooksey Drive in his honor, possibly stimulated the path's creation to enhance buyer interest in Cooksey's nearby properties. 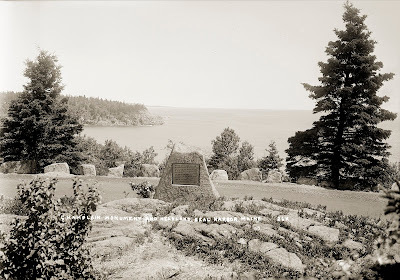 Note: In 1904, to mark the 300th anniversary of Champlain‘s discovery of MDI, the Seal Harbor Village Improvement Society placed a monument honoring Champlain on Sea Cliff Drive and overlooking the ocean. It was just across the road from where today there is a Maine Coast Heritage Trust property and parking lot called the Cooksey Drive Overlook. A very popular monument, perhaps too popular for nearby residents, it was relocated in the 1970s to an obscure Seal Harbor ledge abutting Acadia National Park, where it now overlooks Route 3 near the entrance to the Day Mountain Trail. A 1954 path guide describes it plainly: "Shore Trail. C. 2 hours. Starts at Ingraham point and follows the shore to Hunters beach. "*5 Likely the last map to depict the Shore Path was the one that accompanied this guide. The guides show an increasingly eastern start for the Shore Path since publication of the 1896 map. This might indicate that progressive private development east of the Crows Nest denied its use. The lackluster description in the 1954 guide is a sign the Shore Path by then had fallen into desuetude. 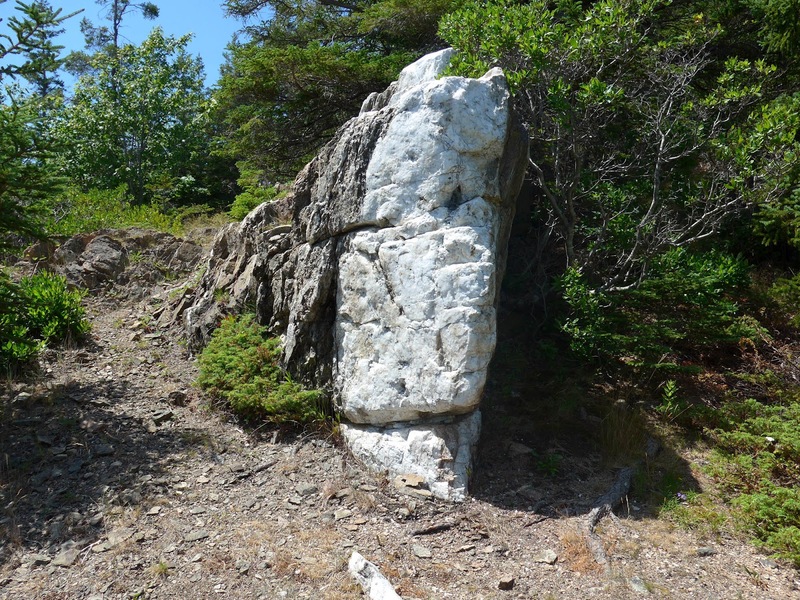 Anne Funderburk, a Seal Harbor resident and historian, recollects "The Seal Harbor Shore Path was built and maintained by Cooksey Realty (later Seal Harbor Realty) ca. 1895 to provide access to the shore for people who bought land from Cooksey Realty which was not waterfront land. The deeds to those lots included the right, in perpetuity, to walk the Shore Path. 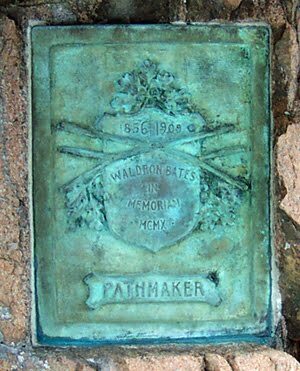 My grandfather, George Stebbins, saw to the maintenance of the path until after WW II, by which time the cost had become prohibitive. 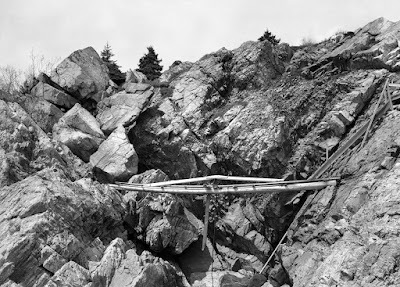 Bridges were washed out during winter storms and waves eroded the lower parts. I walked that path many time as a child. The location of the Shore Path, represented in red on the map, is an approximation except for the known locations of the railings and quartz vein. It is always imperative to use caution when hiking abandoned paths. 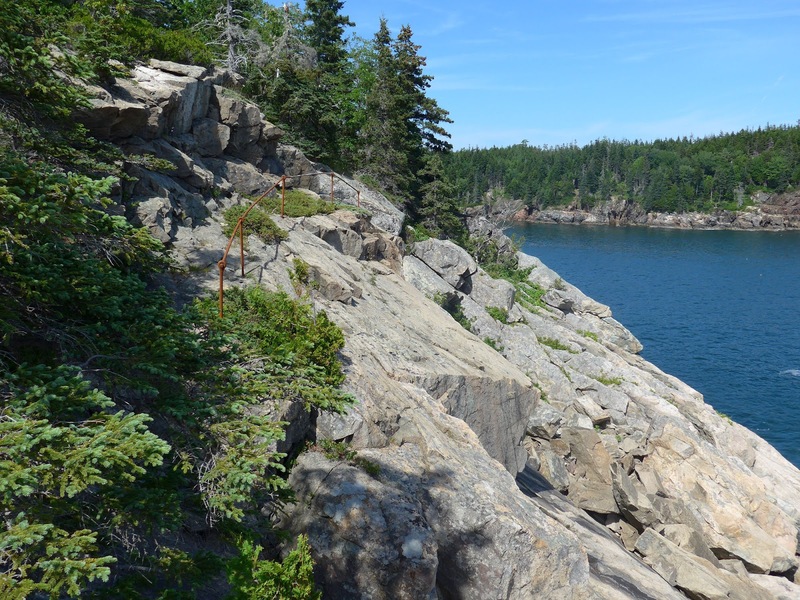 The once imposing Seal Harbor Shore Path is no exception, especially when the ledges are wet and slippery. 1 Path Map of the Eastern Part of Mount Desert Island, Maine, by Waldron Bates, Edward L. Rand and Herbert Jaques. 1896. The map location "Crows Nest" apparently was also referred to as "Ravenscleft." A 1903 newspaper mentioned Ravenscleft, as follows: "Another house which the Hodgkins firm has just completed is the summer home of Mr. and Mrs. James Rhodes of Boston. The house sets [off Sea Cliff Drive] among the trees high on a promontory, and derives its name 'Ravenscleft' from the location." Bar Harbor Record. June 10, 1903, p. 1. 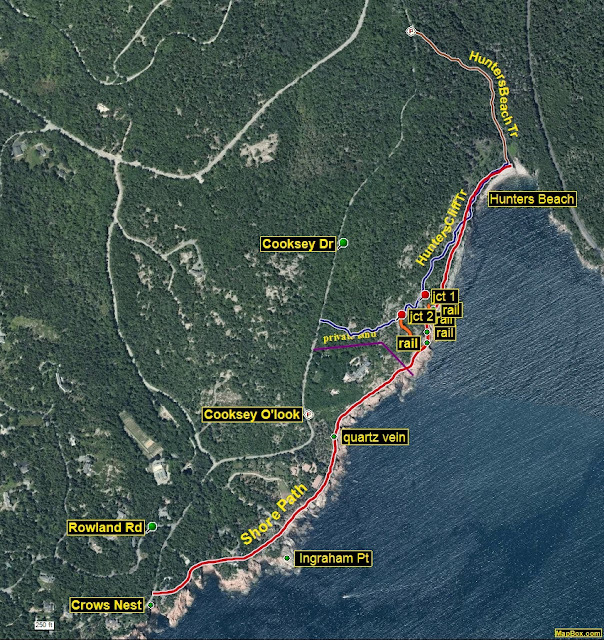 2 Paths and Trails of Northeast Harbor and Vicinity, published by [the] Village Improvement Society. 1914. 3 A Path Guide of Mount Desert Island Maine, published by the Village Improvement Societies of Bar Harbor, Seal Harbor, Northeast [Harbor], and Southwest Harbor. 1915. 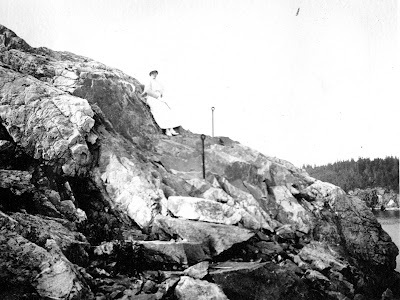 4 Walks on Mount Desert Island Maine, by Harold Peabody and Charles H. Grandgent. 1928. 5 Paths and Trails of Northeast Harbor, Seal Harbor and Vicinity, published by the Trails Committees of the Mount Desert Chamber of Commerce and the Seal Harbor Village Improvement Society. 1954. 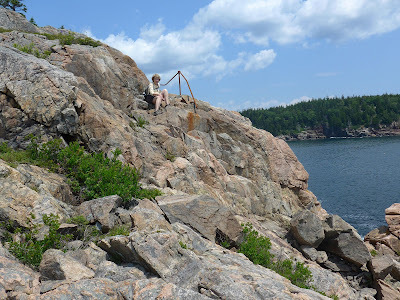 6 I wish to thank Anne Funderburk, vice president of the Seal Harbor VIS, and her husband Lance for their valuable contributions to this article. You guys are daring! Be careful out there. I stumbled across the old pipe railings and wondered if it had been an old VIS trail. Thanks so much for providing the history! Love this trail. I hear trail work improving some of the cliff section has been done? Thanks for the reminder to re-visit. Thank you for posting this! We found this trail while walking along the Lower Day Mt. Trail a few years ago. It's freaky the way the handrails just disappear into nothingness. Terrifying trail. I always go with a very sure-footed hiking friend. Thanks for the update. The private property owners have a legal right, I know, but.... it's aggravating not to be allowed to follow the whole trail.